Indonesian. German. Italian. English. French. 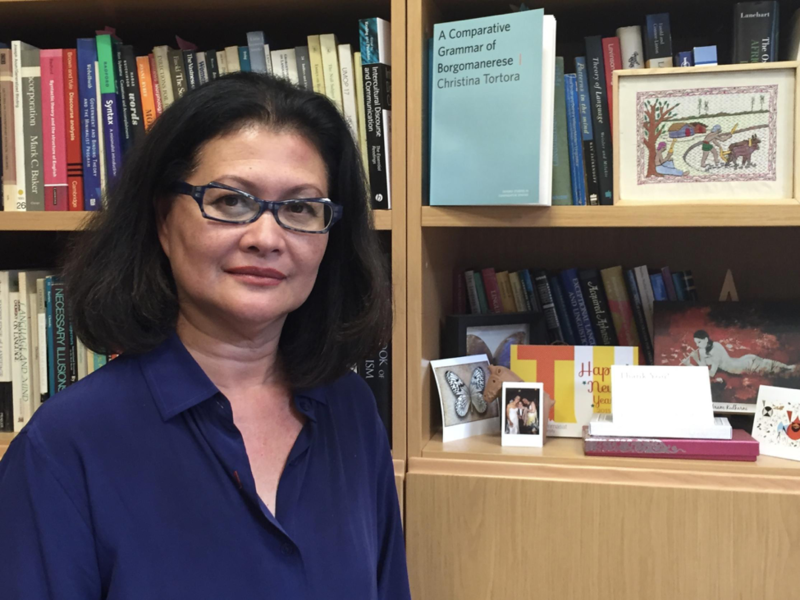 These are the languages spoken by Gita Martohardjono, director of the Second Language Acquisition Lab at the City University of New York’s Graduate Center. She studies how the languages we know affect the languages we learn — and how those new languages affect our earlier ones in turn. Martohardjono is a perceptive and sympathetic listener with an easy, bright laugh. Her lab managers praise her “soft skills.” “Gita likes to make sure that people she works with are happy,” says Ian Phillips, a Ph.D. student who manages a study of brain activity in bilingual Spanish-English speakers in the lab. But Martohardjono also exudes determination and complete competence. “You will never win an argument against her,” says younger sister Nanistya Martohardjono, a designer in Toronto. Gita Martohardjono was born to Javanese parents in Jakarta in 1956. Her father was an Indonesian diplomat, her mother spoke seven languages, and the pair was often abroad. They lived in the Netherlands until Martohardjono began kindergarten in Hamburg, Germany. While Indonesian is her “family’s language,” she says, German is the first language that she can recall speaking in the home. From the age of seven Martohardjono lived in Rome, where she attended an international school with instruction in German. English was offered as a foreign language, but the close-knit students spoke a mixture of German and Italian. At fifteen, Martohardjono moved with her family to Toronto, where she was placed in courses in English as a second language. Only months later, she was removed from those classes as her language skills developed. At some point, a well-meaning advisor suggested that Martohardjono train to teach English as a second language. But when she inquired at English-language Concordia University in Montreal, administrators assumed she wanted to enroll in courses to learn English. The experience turned her off and she instead pursued Romance studies at Concordia based on her love of Italian. That major required a course in linguistics, which Martohardjono compares to puzzle-solving. “I loved it! I just absolutely loved it!” says Martohardjono. “I thought, ‘Oh my gosh, this is so much fun.’ Who knew?” She was hooked. Montreal was a city divided both politically and linguistically and Martohardjono identified with the French-speaking Quebecois sovereignty movement despite not speaking the language at first. “I was happy there, because I was a minority in a political minority,” she says. And so it was partly out of a sense of obligation to her political affiliations that she transferred to the French-speaking Universite de Montreal. Universite de Montreal also offered Martohardjono something Concordia did not, a B.A. in Linguistics, which she followed with an M.A. in Linguistics, also at Universite de Montreal. A Ph.D. from Cornell University came next, and then teaching stints at the Massachusetts Institute of Technology and Queens College, from which Martohardjono has technically been on loan to the Graduate Center for the past twelve years. In other words, although it is clearly more difficult to learn a new language as an adult, the determining factors are social and psychological rather than any changes in brain biology. Cristina Sanz, a professor of Spanish linguistics who studies bilingualism at Georgetown University, is at least broadly in agreement with Martohardjono. She says there are age-related changes in the brain and general cognition that affect second language development. And although the differences are measurable, they are not necessarily meaningful to the ways we use language. Martohardjono notes that while children are often forced to be resilient in new linguistic settings, language learning in adulthood is full of self-consciousness and doubt, with the option to fall back on other languages. “Most adults don’t learn language by immersing themselves because it’s too painful,” she says. As the daughter of a diplomat, Martohardjono says her multilingualism had an international flair and was always looked on positively. But not all bilinguals or multilinguals are accorded the same prestige. She also works with the New York City Department of Education and New York State to provide services to children who have been classified as English language learners. They’re typically immigrants or the children of immigrants and placement exams once put them at a disadvantage if their English wasn’t strong. The idea now is to evaluate academic aptitude in the language that the student is most comfortable with. To do that Martohardjono is developing tests in nine more languages, including Arabic, Urdu and S’gaw Karen, a language spoken by many political refugees from Myanmar. In addition to the evaluations and the lab research, Martohardjono is the chair of the Graduate Center’s Linguistics department and associate director of its Research Institute for the Study of Language in Urban Society. This is so profound, I know a child’s brain can learn up to 12 languages before the age of 9 or thereabout. So, this has been quite a ride for the linguist. I agree, Linguistics is so much fun.